Warning - this version of the film contains graphic scenes of brutality and death, which some viewers may find disturbing. Remembering Srebrenica: 20 Years On is an outstanding documentary, which examines the horror and inhumanity of what happened at Srebrenica. 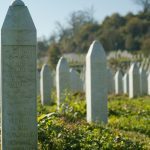 ‘Remembering Srebrenica: 20 Years On’ tells the stories of genocide survivor Nedžad Avdić and Srebrenica mother Hatidža Mehmedović. Remembering Srebrenica Champion and Chairman of its West Midlands Board Cllr Tom Reynolds talks to Stoke City and Bosnia & Herzegovina international goalkeeper Asmir Begović on the importance of holding Srebrenica Memorial Day. Asmir reveals why he believes it is vital that we continue to mark the anniversary of the genocide; why it is crucial that we never forget.